Thanks to Roger Pickard, I have fixed a mistake in the estimate of the Spink image magnitude. It is now considerably fainter than my initial value. MWR 2006 Dec 9, 10:25 PM EST. Below is a light curve of the event, showing these measurements together with V-band values reported to the AAVSO (but not yet processed and verified). If this event were due to gravitational microlensing, then one would expect the light curve to be symmetric around the time of maximum. If one were to guess very very very roughly that the time of maximum might be JD 2,454,040, then one could reflect the post-maximum measurements around this time to get a rough idea of what the microlensing model might predict for pre-maximum values. If you wish, you may look at such a hypothetical sketch. However, before you draw any conclusions about the reality of the microlensing model, please read these comments on the event from Doug Welch. Keith Geary forwarded to me an image taken by astrophotographer Jeff Bullard. All I know is that it was taken on film, then scanned. Here it is. The orientation is North up, East to the left. Alpha Cas is at the left edge, Beta Cas at the top, and NGC 7789 at the right edge. The variable lies near the center of the golden box. Here's a closeup. Note the bright "triangle" of stars to the upper left, and the "circlet" of stars just to the right (west) of the variable. The location of Var Cas 2006 is marked with a pair of bars. 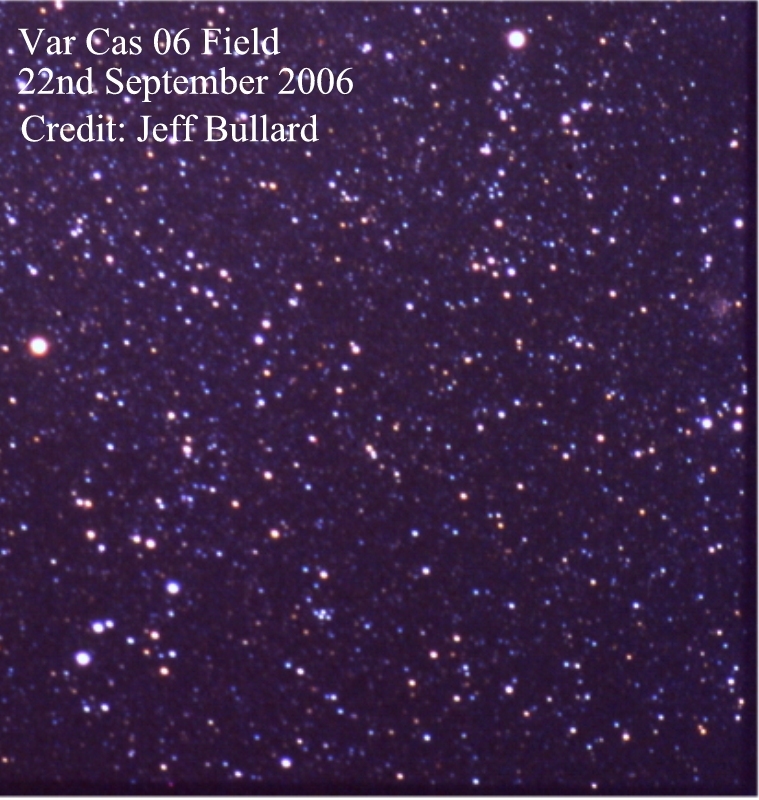 There is a faint, blueish object at that position, representing the merged light of Var Cas 2006 and a neighboring star. At quiescence -- as in this image -- the target (aka GSC 3656.1328 = TYC 3656-1328-1) has a magnitude of about V=11.5. I could make no measurement from this image. I have 24 (that's right, twenty four) 15-minute exposures from the evening of September 25/26 that show the star. Here's a small jpeg of the whole field. I've already identified the star, but it's blended with GSC 3656-1318. The images are with a large-format CCD with 12-micron pixels done with a 40mm f/4 Hasselblad lens and a 15nm wide H-alpha filter. This jpeg is a combination of all 24 frames -- obviously done so show nebulosity along the Milky Way. A portion of the image is shown below, in the standard orientation of North up, East to the left. As in the Bullard image, Alpha Cas is at the left, Beta Cas at top, NGC 7789 on the right. Here's a closeup of the region around the target, which lies between the green bars. The marked position shows the merged light from the quiescent Var Cas 2006 and a neighboring star of similar brightness. Note that the total light is somewhat fainter than that of most of the members of "the circlet." Remember that this is an H-alpha picture, so it records red light; and recall that the target star is blueish (spectral type A2 or so). I made no measurements from this image. NGC 7789 is the cluster near the top right. The image is tilted by about 30 degrees relative to the standard orientation. The region around Var Cas 2006 is at the bottom right edge of the image. I have labelled the stars used to calibration the photometry in this image below. Note that the light from Z1 is partially merged with that from Var Cas 2006, which appears between the vertical bars. Photographic film does not record light in a linear fashion. The digitized version of this image has a PSF which looks very different from ordinary CCD images. Below are radial profiles of three stars, a relatively bright star on the left, an intermediate one (labelled "I" in the chart) in the middle, and a faint star on the right. Note how the PSF grows narrower for faint stars. On a CCD image, although the core of the PSF might saturate, the wings would be more similar for bright and faint stars. I tried two different techniques to extract instrumental magnitudes from this digitized image. The target, Var Cas 2006, is only partially resolved from the nearby star "Z1". One would expect that the PSF-fitting should do a better job of measuring each star's light, in theory; but if the PSF isn't the same for all stars, then it might not. The instrumental measurements for each method are shown in the table above. We can then compare each set of instrumental magnitudes to Henden's photometry to calibrate the instrumental values (I'll leave star "Z1" out of the calibration step for now, since it is merged with the target star). I'll show the results for each method in turn. with a scatter of 0.16 mag, uncert in slope of +/- 0.99, correlation coefficient r = 0.97. I checked for the residuals as a function of V mag, and as a function of (B-V) color, and found no significant trends in either case. with a scatter of 0.17 mag, uncert in slope of +/- 0.47, correlation coefficient r = 0.97. I again checked for the residuals as a function of V mag, and as a function of (B-V) color, and again found no significant trends in either case. Keith Geary forwarded to me an image taken by astrophotographer Gary Hatfield, on Oct 22, 2006. Here's the original color JPEG image. Below is a closeup of the region around the target. The signal from the target is low, but it appears roughly as it did in earlier images: somewhat fainter than most of the stars in the "circlet." Hi Roger, I saw the request to send you pictures of Cassiopeia in October. I have some taken in very clear skies in North Yorkshire on 24th October with my Canon 300D and a 50mm F1.4 lens. Exposures were around 10 secs and between ISO 800 and 3200. Of the two images, the one taken at a setting of ISO 800 was better than the one at ISO 3200, so I concentrated on it. I converted the original JPEG image -- alas, full of compression artifacts and only 8 bits per pixel in each of the RGB planes -- into FITS format. Because the original was a JPEG image, it had already lost much of its information; we should expect mediocre results from it. A portion of the image near the region of interest is shown below. I have a picture (a single exposure only) of the western part of Cassiopeia, RAW format (unprocessed), centred on alpha Cassiopeiae (Schedar)taken at 2006.10.25 at 21:42 UT. Camera: Canon EOS 350D digital(8M pixels) Lens: Canon 28-135mm zoom at 135 mm Shutter sp: 30 sec Aperture: f5.6 ISO speed: 800 Piggyback on Meade CST The target star is visible, just within the frame at upper right corner. I first used Photoshop to turn the original RAW image into a TIFF image with 48 bits per pixel, 16 bits each in Red, Green, Blue channels. This TIFF image was very large: about 47 MBytes. Next, using the libtiff library, I converted the TIFF image into 16-bit integer FITS files: one each for the Red, Green, and Blue channels of the camera. The CCD chip in this Canon camera has a green channel with spectral response sort of similar to the Johnson-Cousins V-band. I decided to restrict my analysis to the "G" channel of the image and try to convert the results to V-band. Below is a small subsection of "G" channel of the Spink image, in the general region of the target. The original image has North to the upper-left, East to the lower-left; the "triangle" of stars appears in the upper-left portion of this subsection. 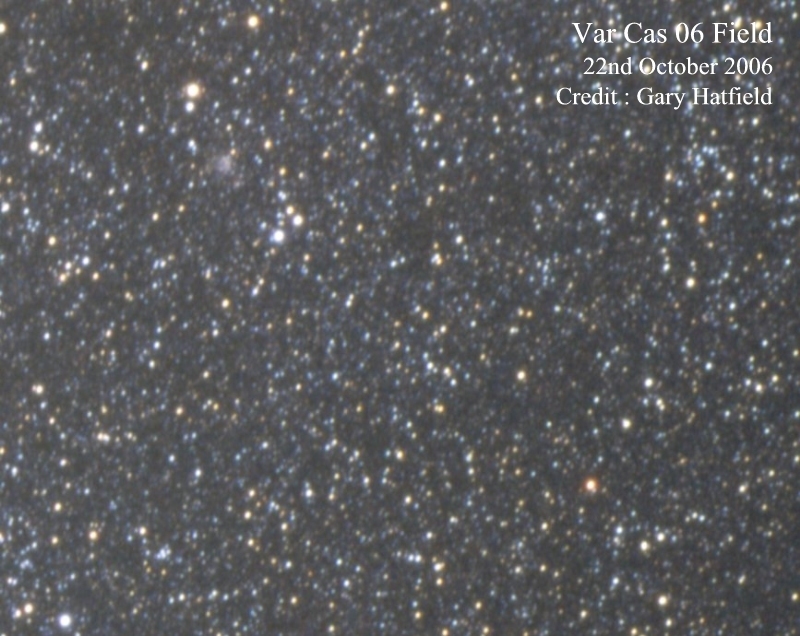 In this image, about 4-5 days before maximum light, Var Cas 2006 is pretty faint. 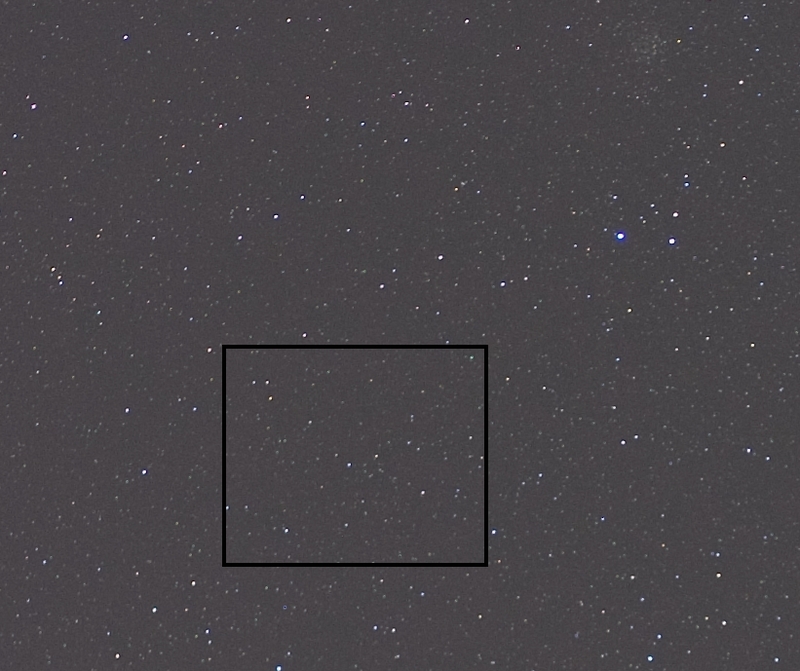 It is clearly fainter than most of the stars in the "circlet" asterism; for example, the circled star "C". It is also clearly fainter than the nearby star "N", to its south. I found that the relative instrumental magnitudes of Var Cas 2006 and the nearby stars "C" and "N" could vary significantly, by up to +/- 0.2 mag, based on the size of the circular aperture used to extract light. I believe that this is the major source of uncertainty in the measurements. I calibrated the instrumental magnitudes in two ways. Using only stars "C" and "N", which have good BVRI photometry from Arne Henden. The conversion factor from instrumental mag to V-band mag is about -3.55, with a scatter of +/- 0.06 mag. The star "N" is very red, (B-V) = 1.51, whereas star "C" is blue, (B-V) = 0.45. There's too little information to look for a real color term, but the suggestion is that reddish stars are a bit fainter in the instrumental system than blueish ones; this is consistent with more definite measurements of another Canon CCD picture (see Geary image, below). with a scatter of only 0.11 mag. in which the formal uncertainty in the slope is +/- 0.13. The first method yields a value for the source of light at the position of Var Cas of about V = 11.07; the second method yields a value of Vt = 10.89. I will adopt the second value. That source is mostly due to the light of Var Cas 2006, but there is a small contribution from the nearby star at (RA = 2.3528, Dec = +54.6691), with V = 12.335 in Henden's photometry. I estimate that the contribution of that contaminating star's light to the 2-pixel aperture around Var Cas 2006 is about 0.04 mag, so I conclude that the Vt mag of the star was 10.93.
which yields V = 10.91. I assign a large uncertainty to this measurement, however, due to the pixel-to-pixel artifacts in the image, and due to the inconsistency of about 0.20 mag from the two different methods of calibration. I was browsing the UKAI bulletin board when I saw your request, forwarded by Duncan Miller (aka Dogman on the site). I'm attaching a jpg showing an image I took on the 26th of October. It is a crop of a widefield using a canon 10D DLSR with a 28mm lens. I've noted Cassiopeia Alpha and Beta for reference and I believe you can see stars down to the magnitude you require. I think that the star you are looking for is directly across from Cass Beta just to the right of centre. The image represents approximately 6 minutes of exposure at iso1600. It was taken in the village of Ulleskelf in North Yorkshire. I decided to use a small aperture to extract instrumental "G-channel" magnitudes, in order to avoid as much contamination from neighboring stars as possible. I chose an aperture radius of 2.0 pixels = 105 arcsec. I followed a procedure very much like that described above for the Spink image to turn the instrumental magnitudes into Johnson-Cousins V. First, I compared the extracted magnitudes of a number of stars in the image to their Tycho Vt magnitudes. I made several passes through this procedure with different subsets of stars, discarding the brightest stars in turn, because they tended to have the largest residuals and peak pixel values near the saturation limit. In the graphs below, I show one typical run through the procedure. and as a function of (Bt - Vt) stellar color. The uncertainty in the slope was +/- 0.099. I decided to make the correction implied by this color term, using an assumed color (Bt - Vt) = 0.30 for the variable. I derived a Vt magnitude for the light at the star's position of Vt = 10.71, with a formal scatter of about +/- 0.10 mag, based on two calibrations with different subsets of stars. Now, in this image, the pixels were so big that the light I measured was a mixture of light from four stars. The chart below is a very nice color composite from POSS images which was made by Bela Hassforther. I estimated the fraction of their light that each of these three neighbors would contribute into the 2-arcsec aperture of the variable, then solved for the apparent magnitude of Var Cas 2006 which would yield the measured Vt = 10.71. The result was that the variable should have had approximately Vt = 11.26 (0.55 mag fainter than the combined total light). Finally, assuming a color (Bt - Vt) = 0.30 for the variable again, I converted the Tycho Vt magnitude to the standard Johnson-Cousins scale. The final result is V = 11.2, with a pretty large uncertainty. I'm not sure exactly when this image was taken. Davison writes that the approximate time of the exposure was 10 PM (Greenwich) on Oct 26, 2006, from his site in Yorkshire, England. We may be able to improve this time later. An AAVSO alert came to my mobile phone at 1919UT, I was able to image this field with a 135mm lens at f2.8, 60 seconds exposure at ISO 800 with a Canon 300D at 2012UT, 31/10/2006. Keith sent me a copy of the original RAW image, which I was able to convert into 48-bit TIFF, and thence to 16-bit integer FITS, one image each for the Red, Green, Blue channels. Again, I chose to concentrate on the Green channel only, and try to extract a V-band measurement. Below is a portion of Geary's full image; North up, East left. NGC 6689 is visible near the top right. A box surrounds the field of the variable. Below is the G-band channel alone, displayed in reverse video, zoomed in just a bit. We can zoom in even farther; this time, the target star is circled. Var Cas 2006 is clearly much brighter than any of the stars in the circlet (and specifically "C"), or the nearby star "N". The estimated uncertainty is a combination of the scatter from the color calibration, and the variations in relative instrumental magnitudes with choice of aperture size.